An uncontrollable preoccupation with representing what is in front. 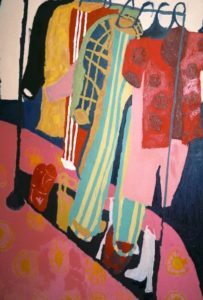 Built upon the pillars of life drawing, the domestic and repetition, artist Florence Hutchings paints still life’s that depict everyday settings. In fact, her interest in drawing and painting objects doesn’t just come from the things themselves, but also from the spaces between them; “the negative space they create.” Hutchings pushes her subject matters (including shoes, clothes, shops, or cars) to their limit, ending up in works that reflect objects in their most abstracted forms, by repeating them and exploring them in a vast array of settings, compositions, and colours. “I like when people respond to my paintings with questions like “is that a mermaid tail?” or “is that a tent”, Hutchings mentions. The Kentish-born artist deals with depicting something in all the possible ways, but a thorough look at any of her work reveals how intrigued she is with her surroundings. We went to see Florence at her studio, where she made us know her interest in representing what is in front of her. Florence Hutchings (b. 1996 Kent UK) is undertaking a Painting degree at Slade School of Fine Art. She has exhibited widely in the UK at the Chopping Block Gallery, the Crypt Gallery, Doomed Gallery, and Geddes Gallery. She has been awarded the Lynn Painters Stainers Prize (2016-2019). Florence is currently living and working in London. I’ve always believed play to be so important in the process of painting, this is true for me anyway. When I start to get bored with a painting, I try to change things up a bit; put my brushes on bamboo sticks, use materials I’ve never used and generally try and approach my painting differently. So yes, I suppose I do embrace a childish side in my practise. Since childhood, you have been inclined to draw and experiment, given that your father is an artist. Is he the main reason that you got interested in making collages? Does his practice feed yours? For sure, my dad has always been such a big influence for me. He’s the person I go to when I’m stuck with my work! Me and my dad actually have a joint show coming up together in June at the Nucleus Arts in Medway, back home where I grew up. What is your process like? Do you have any rituals when painting from life? I usually tend to draw from life. I then take these drawings and use them as a starting point for some of my larger paintings. I also tend to leave the drawing behind half way into working my painting‘s, allowing me to have a conversation with the canvas rather than the original drawings. When you started your painting degree at the Slade School of Fine Arts, your work used to concentrate on geometrical structures. Would you say that your approach is going into other directions? 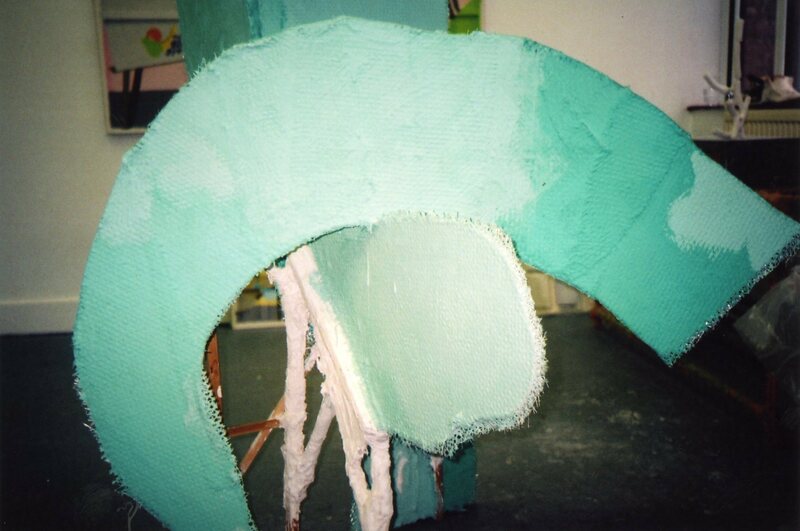 At the start of my degree, my work was much more abstract. As time went on, I became really stuck with this way of working. Trying to make a painting out of nothing became quite tiring and boring for me. It was at this point that I started to reference my drawings, from then on, I have been painting still life’s, shoes, clothes, shops, cars and many other things that interest me. What is the role of colour within your practice? I love colour, it’s something that never ceases to be fun and surprising. Looking at artists I love always helps me in terms of colour reference. From Matisse’s use of red, to Braque’s use of brown and Francis Bacon’s use of orange; it’s part of what makes the process of painting so exciting for me. From colourful passion fruit drawings passing through window front representations, to “The Northern Line” collages, a result to your journeys through the London Underground. Do you always work in series? Can you tell me more about the clothes, shoes, or accessories, which appear in your latest work? Do you use a life model for these? I never really use a life model for these. I like the objects on their own, it’s not only the objects that intrigue me but the space between them; the negative space they create. 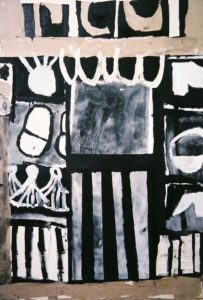 Henri Matisse, Betty Woodman or Jean Dubuffet are artists that you commonly refer to. In which way do their practices inspire yours? Matisse’s work is such a massive influence on me. 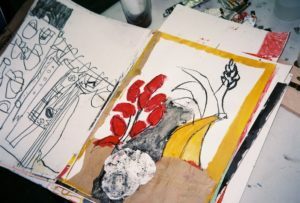 The way he uses colour, composition, collage and paint is so inspiring when making my work. I look at his work continuously when I’m stuck! Betty Woodman is great as well, her exhibition at the ICA was on when I was in first year, and it completely knocked me out. It cemented the fact that yes, it’s okay to paint a still life in 2018! You produce work in a variety of scales, from A4 drawings to paintings or large-scale site-specific works. Was it the most challenging work you have produced up till now? 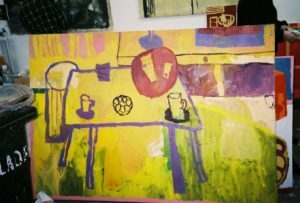 Probably my latest big painting work piece was at the Slade School of Art, where I painted a fruit and vegetable market stool. This piece was 4×3 metres. 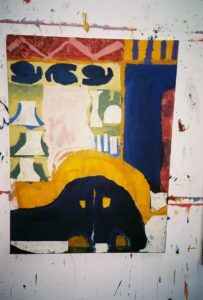 Although, it was so much fun to attack it with paint and collage, and to make the painting work as a whole and not split it up into different sections was very difficult compositionally. Not only this, but using numerous colours on such a big scale was challenging, in the end I had to bring it back to minimal colours for it to work. The domestic setting in your paintings is often decomposed, seeming like you are playing with perspective. What interests you about the domestic? I really enjoy using the everyday in my paintings. I think it’s the idea of taking something simple and making it so much more. Maybe part of the reason I’ve always used a domestic setting in my work is the reliability of it. It’s what surrounds me in my studio and at home therefore, it’s something that is always in front me of to draw and work from. Slade’s final degree show is around the corner. What work will you present and why? I’m in my third year at Slade, but luckily, it’s a four year course! I have no idea what I will present yet, but I know there will be drawings and paintings. It’s great to have an extra year at Slade because I feel like I have longer to not worry about the end result, and go through many stages of trial and error within my work. I hope to keep this momentum and approach going in my fourth year! You are going to be exhibiting in JUICE at 5th Base Gallery, Shoreditch, along with artists such as Hannah Tilsonor Lucia Ferrari. Do you have any other upcoming projects? I have the show with my dad coming up this summer, something I’m really excited to do! Myself and my boyfriend, Danny Romeril are also planning on having a joint show in London sometime this year.